Mr Meringue is a U.S. E-Liquid brand by the mixing specialists behind Charlie's Chalk Dust. The line is inspired by the sweet and zingy flavours of lemon meringue pie, featuring a mix of Lemon Curd, Sugar, and Meringue flavours. With a high VG level of 70%, the makers of Mr Meringue are committed to using high-quality, natural ingredients to create a delicious, dessert-flavoured vape. 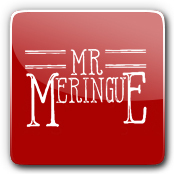 Mr Meringue runs alongside the Ms Meringue line to cater to the cravings of sweet-toothed vapers all over the world. Bestselling flavours include the notorious Lemon Pie, characterised by gooey, tart flavours atop a crunchy biscuit base; Rainbow Sherbet Meringue Pie by Uncle Meringue, a blend of fruity, rainbow sherbet mixed into classic meringue pie, and Strawberry Muse by Ms Meringue, which mixes the sweet tang of strawberry with buttery meringue. All flavours are available in nicotine strengths ranging from 0-6mg, and all Mr Meringue E-Liquids are available in either 10ml or 50ml short fill bottles. There's no doubt about it: the mixing experts at Charlie's Chalk Dust have done it again, bringing you sweet, gooey flavours that fully satisfy your dessert cravings. Mr Meringue E-Liquids are some of the most popular vape products on the market, so order yours from Redjuice today. Aunt Meringue by Charlies Chalk Dust eLiquid | 50ml Short Fill - The latest product in the hot - selling Mr. Meringue series, Aunt Meringue by Charlie's Chalk Dust features the flavour of a tart apple meringue layered over a buttery, flaky pastry crust. It's a perfect addition to any e-liquid rotation. Strawberry Muse by MS Meringue eLiquid | 10ml Bottles - Considering the worldwide popularity of strawberry e-liquids, it's probably safe to say that strawberry is the muse of many e-liquid makers throughout the world. In that sense, Strawberry Muse by Ms. Meringue has a perfect name. It captures the flavour of a strawberry pie topped with light merinque. Rainbow Sherbert Meringue Pie by Uncle Meringue eLiquid | 50ml Short Fill - Until now, the Mr. Meringue line from Charlie's Chalk Dust has done an excellent job of capturing the flavours of some delicious real-life desserts -- but Uncle Meringue by Charlie's Chalk Dust is something else entirely. This e-liquid tastes like a pie made from frozen rainbow sherbet, with some flaky pie crust on the bottom and lightly browned meringue on top. Lemon Pie by Mr Meringue eLiquid | 50ml Short Fill - Are you tired of lemon e-liquids that taste like furniture polish? Get ready for Lemon Pie by Mr. Meringue. This Charlie's Chalk Dust product layers the sweet flavour of lemon curd over a buttery, flaky pie crust base. It's everything you've ever wanted a lemon vape juice to be. Strawberry Muse by MS Meringue eLiquid | 50ml Short Fill - This strawberry-infused delight is the first follow-up to the wildly successful Mr. Meringue e-liquid from Charlie's Chalk Dust. Strawberry Muse -- also known as Ms. Meringue -- features the flavour of sweetened strawberries spooned over a buttery pie crust base. Lemon Pie by Mr Meringue eLiquid | 10ml Bottles - If you try only one lemon e-liquid during your time as a vaper, Lemon Pie by Mr. Meringue should be the one. Delivering a sweet lemon merinque pie flavour with absolutely none of the "furniture polish" taste so common in other lemon e-liquids, this is probably the most well-balanced lemon e-liquid you'll ever find.